This movie was already playing in Indonesian cinemas since yesterday but I was unable to see it on its premiere date. So instead my wife and I saw this one today. 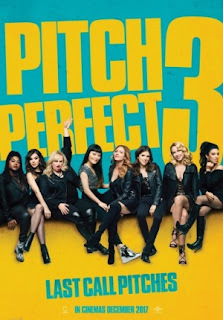 To be honest I have never seen the first and second Pitch Perfect movie when I saw the trailer to the movie few weeks ago, but when I noticed it looked like a funny movie, I immediately looked for them online. So I managed to see Pitch Perfect and its sequel last week before I see this one. Well let us get on with the movie now. The girls from a cappella group The Bellas consisted of Beca (Anna Kendrick - Trolls, The Accountant etc), Fat Amy (Rebel Wilson - Night at the Museum: Secret of the Tomb, Grimsby etc), Chloe (Brittany Snow - John Tucker Must Die, Hairspray etc), Aubrey (Anna Camp - True Blood TV series etc), Lily (Hana Mae Lee), Cynthia (Ester Dean), Flo (Chrissie Fit), Jessica (Kelley Jakle), Ashley (Shelley Regner) and Stacie (Alexis Knapp) have graduated from university and felt they were going nowhere in their lives after Bellas. So when they had an opportunity to perform in the tour of USO (United Service Organization), the Bellas decided to form the group together and sing once again. With the addition of Emily (Hailee Steinfeld - The Edge of Seventeen, 3 Days to Kill etc) who was the next generation Bellas and still in University, they went ahead with the tour. In the USO tour, there would also be other groups performing and trying to get the opportunity to be the opening act for DJ Khaled at the end of the tour & sign for the record label. The Bellas' received fierce treatment from a group band led by Calamity (Ruby Rose - John Wick: Chapter 2, Orange is the New Black TV series etc) who saw them as their competition. Meanwhile during the tour, some of the Bellas would meet with people who could affect their lives, such as a National Guard officer named Chicago (Matt Lanter - The Roommate, USS Indianapolis: Men of Courage etc), Theo (Guy Burnet) who assisted DJ Khaled and a mysterious guy Fergus (John Lithgow - Daddy's Home 2, Interstellar etc). So could the Bellas reach their goal to become the opening act for DJ Khaled? How would they cope lives after this tour? Find them all in the third and hopefully the final part of the trilogy of the Bellas. As the third part of this musical comedy movie, I could not help but to compare this with the first and second movie. Just what I suspected, the movie's story was not as good as the second one, let alone the first one. To me personally (and my wife shared the same sentiment as I did), the first one was the best. That one was truly honoring the a cappella style of music with the competition to be the best at university level and we get to see the earlier problems a big group would have in real life. The second one despite the movie expanded their universe to a world competition, the story itself was probably a bit less good, but the competitors of the Bellas were still a cappella singers. Whereas this time, the competition comes from a real band which I think was not really apple to apple, plus the story of this third one was a bit forced. The nice thing about this movie was still the performance of the Bellas were still as good as before and they also seemed to give more portion to other members of the group (except Jessica and Ashley characters. LOL). And the jokes were still quite similar to the earlier movies. My favorite character in this film (and the 1st & 2nd ones) was definitely Fat Amy who was very funny, plus she gave a surprisingly cool scenes in the boat towards the end of the movie. Oh, Lily's character was also very fun. This time, the characters of John (John Michael Higgins - Almost Christmas etc) and Gail (Elizabeth Banks - Power Rangers movie, The Hunger Games series etc) were not as much as the previous movies, but they still gave crazy fun commentaries as usual. 1 other thing, I still think that the movie might not be suitable for children whom I noticed were there when I saw this in the cinema today. The songs this time were quite up to date and seeing this movie, you should expect to see a lot of songs wonderfully sung in a cappella style. My favorite song scene was the very cool brief riff-off between the Bellas and other groups. Basically the movie was having a similar formula with the earlier movies, like the competition, the crazy stuff they always managed to do, some relationships, and funny moments. The best thing about this movie to my personal opinion was the last song which would bring out lot of emotions for fans of the Bellas (like my wife). Plus the end credit scene was also fun to see as it served as reminder of the journey these girls had all the years. Overall, if you are fans of the group and also love to see songs sung in a cappella style, or any other style, plus some fun jokes, then this movie is definitely for you. This is a light movie that should not be over thought and just to be enjoyed as pure entertainment. However, if you must have a logical story in a movie, then this might not be to your liking. My advice for you to forget all your logic and just go enjoy the movie, maybe sing in your own heart. Do not forget to watch the Pitch Perfect 1 and 2 first before watching this one so you could be familiar and understand the characters (and some of the jokes) better. USO (United Service Organization) is a nonprofit organization that provides live entertainment, such as comedians and musicians, and other programs to members of the United States Armed Forces and their families. (taken from Wikipedia).